For projects in the creative arts, crowdfunding is notoriously difficult. Traditional crowdfunding platforms have lower success rates for creative or design related projects because they are pitched against other highly competitive categories (e.g. technology). At LiveTree we exclusively support creative projects so your chances of success are much greater. LiveTree is an established, socially responsible crowdfunding company based in London, UK. Over the last two years, it has captured 5% of the UK crowdfunding market (in the film and content category) and forged partnerships with several leading names in entertainment, including the British Film Institute Future Film, the Screen Arts Institute, Red Rock Entertainment and 20 independent organizations. LiveTree has compiled a contact directory of 14,000 entertainment suppliers and thousands of individuals who work across film, TV and content. Creative project funding, creation and distribution: The entertainment industry suffers from incoherent methods of funding. There is no best-practice funding model, with the result that project finance is often structured on a piecemeal, project-by-project basis, driven by access, timing and contacts. The same incoherence is true of the current content distribution process. Traditionally, new content is shared with the wider market via film festivals and content fairs. This route to market is frequently out of reach for creators, meaning that valuable content — potentially the next big TV drama, for example — can be overlooked. The current system also impedes broadcasters and distributors seeking fresh new content since it is opaque, inefficient and lacks a consistent mechanism for evaluating the market potential of projects in economic terms. Content gatekeepers: The big online distributors, such as Netflix, Google and Facebook, act as creative gatekeepers for new content. By dominating the market, filtering and pre-selecting what is available to viewers based on their own profit, these corporates add yet another barrier preventing consumers from accessing the content they want. Consequently, content-makers currently have no direct, peer-to-peer means by which they can contact their — sometimes millions of — engaged fans, who would willingly pre-purchase their content and promote it passionately among their friends and contacts. Bridging the gap between traditional creative industry and technology: Economic turbulence has taken its toll on creative projects, and budgets have shrunk markedly in recent years. Arguably, projects are becoming more dependent on personal connections, private wealth and insider knowledge than talent and dedication. 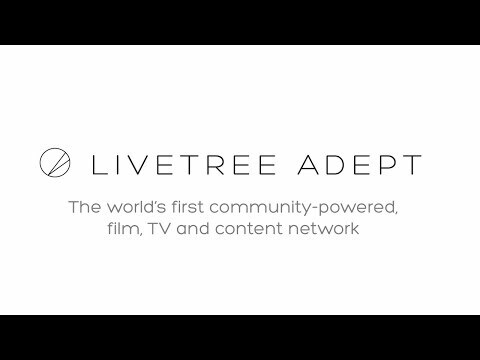 LiveTree ADEPT: A decentralized platform that reimagines entertainment’s value chain: the process of content creation, funding and distribution. Distribution is via Blossom, a game-changing, decentralized digital rights management system that is set to revolutionize how content is interacted with, shared and consumed. LiveTree Seed: Supporting ADEPT is a digital token called Seed, designed to provide equality and remove gatekeepers restricting the market. Its value is created through demand, driven by its use throughout the platform and subsequent repurchase from the secondary market. LiveTree Incubators: The Incubators, operated through LiveTree’s partners by Oscar- and BAFTA-nominated filmmakers, are designed to advance the careers of both emerging talent and experienced filmmakers. By providing content and real-world projects, they also serve to migrate the current industry to ADEPT. In addition to delivering real-world projects that can be used to stress test smart contracts during the development stage, the Incubators provide content that can be used to market and add value to ADEPT, because the content is subsequently sold in Seed. Great, vision. Good luck guys! Ground breaking pre-pay-to-view model launched enabling fans to pre-purchase film & TV they want to be made.